Whether it’s smaller items like 5-gallon buckets or an entire rail car, we’ve got a spill containment product to make sure that you are in compliance with the EPA and SPCC regulations. Spill pallets are available for one to four 55-gallon drums. If you need spill containment but want something that offers a lower profile, check out our Spill Decks. If you need spill containment for your drums but need safe outdoor storage as well, take a look in our Hard Top Spill Pallet section. 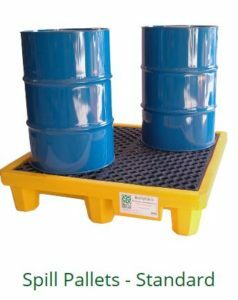 For spill containment for larger containers, tanks and IBCs, we offer a complete line of IBC Spill Pallets.